It has been a very busy few weeks around here. The action started when my parents arrived for a visit the evening of August 5. The next day, they immediately set about finding odd jobs to do around the house and yard to keep themselves busy while I was at work. For example, my dad installed the custom kitchen tiles I had ordered back when I did my kitchen renovation; they really boost the elegance of the whole room. He also did a lot of work in the back yard, clearing weeds and branches to make room for the new fence. The evening of August 7, we had a game night with the neighbors and their friends. I made a whole meal using things harvested from my garden (potatoes and pickles in potato salad, tomatoes and parsnips in soup, and mixed berry compote for dessert). It was fun, but then I had to get up early the next morning for work, so I didn't get much sleep. On Saturday, August 8, after finishing my shift at work, I came back home to pack for a two-week trip to Japan. My parents and I would be joining mangaroo, sara_tanaquil, and wednesday_10_00 in Tokyo, and our flight was departing at 2am Sunday morning. A neighbor kindly drove the three of us (and all our luggage) to the airport, and our adventure began. megory once again had trouble with TSA, because her boarding pass didn't print out her first name. I had to call up her email on her mobile device to show the confirmation notification for the flight, which included her full name. After that complication, however, the rest of the trip went fine. After getting barely any sleep the night before, working a full shift of work, then staying up until 2am for boarding the plane, I thought I would sleep through the flight...but it was not to be. I think I managed to sleep about two hours, but the rest of the time I just sat there restlessly watching movies. We arrived at Haneda at about 4:45am local time on Monday, August 10, got through customs quickly, and waited a little over an hour for our bus to our hotel in Ikebukuro. We eased into our shopping extravaganza by hitting the shops near the hotel. On Tuesday, we ventured out to Shibuya for more shopping. I picked up three bags full of comics and then made an additional stop at Shinjuku on the way back to browse at a board game store. In the evening, my parents treated us all to a meal at a nearby okonomiyaki restaurant. Wednesday, August 12, we did more local shopping and then met up with an acquaintance who was holding onto a box full of board games for me that she had purchased on my behalf at the spring Tokyo Game Market. We had a delightful lunch with her, and then later picked up supplies for a group wine and cheese night in one of our connecting hotel rooms. 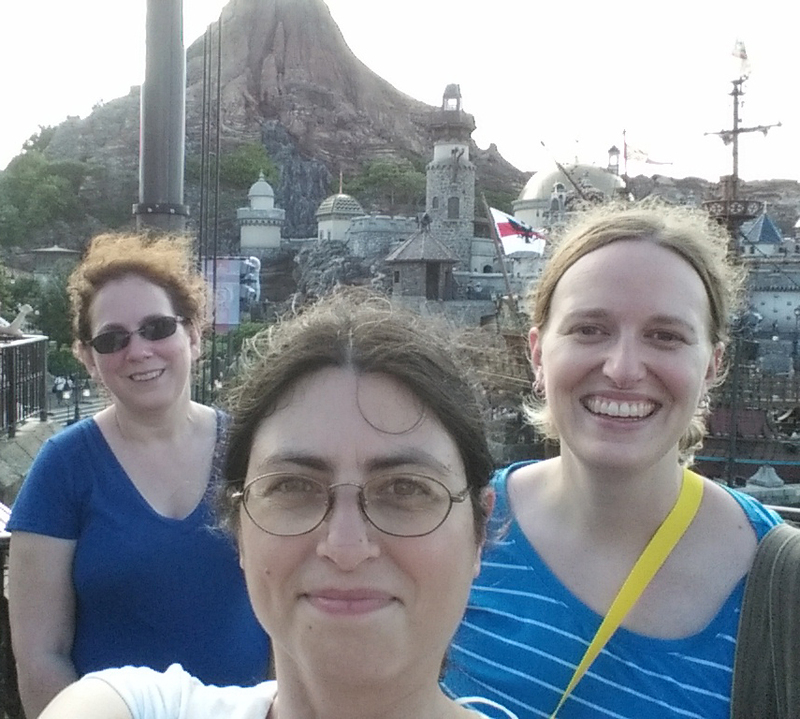 August 13, my parents occupied themselves by exploring the area while the rest of us spent the day at Disney Sea. We had bought tickets at the Disney store in the same mall as our hotel the day before, so we were able to take the subway from a tunnel entrance in the mall and get into the park early, at about 8:15am. It was a very long day, filled with numerous rides and lots of walking. It rained a bit at first, but after a while the rain tapered off and we were left awkwardly carrying around our umbrellas the rest of the day. I finally worked out how to use the camera on my Kindle and managed to get a decent photo. (Note: I am intentionally excluding all the shots in which I look terribly puzzled because I have no clue what I'm doing.) We stayed at the park until closing, after which we took the subway back...and learned that the subway tunnel leading to the mall closes at some point in the evening. We had to exit across the street from the mall and walk back from there. 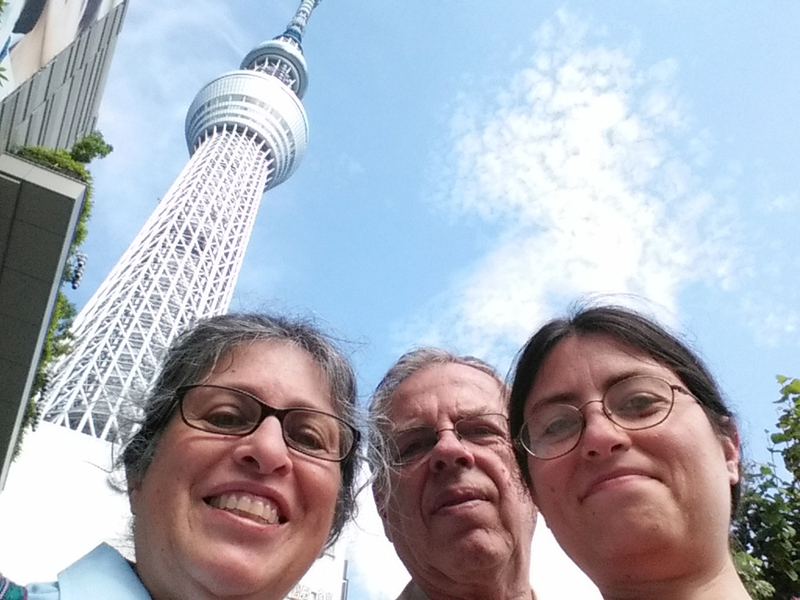 On Friday, I took my parents on a sightseeing trip to Yokohama while everyone else worked on planning our attack on Comiket in preparation for the next day. We exited Yokohama station and spent some time shopping at the department stores there. We picked up some lunch items at the basement grocery shops and paused to eat on some handy benches with a nice view. Then we walked across a pedestrian bridge to the Minato Mirai area, stopping first at the Nissan world headquarters, which is set up like a museum with a bunch of interesting cars on display. We walked around the Minato Mirai area for a while, passing many impressive luxury car dealerships along the way. When we got to another shopping center, we saw a sign posted for a summer festival to be held in an oceanfront park that evening, so we decided to stay to watch. We spent most of the afternoon sitting on benches watching the ocean, though we did briefly visit the Red Brick Warehouse, which was jam-packed with people, probably due to a Pokemon festival being held right outside the building. Finally the summer festival started, and we were able to watch the bon-odori, complete with a live taiko drum performance. We ate some ice cream from a vendor stall and then found a subway that would take us back to Ikebukuro. August 15 was Comiket Day. Technically, Comiket lasts three days. 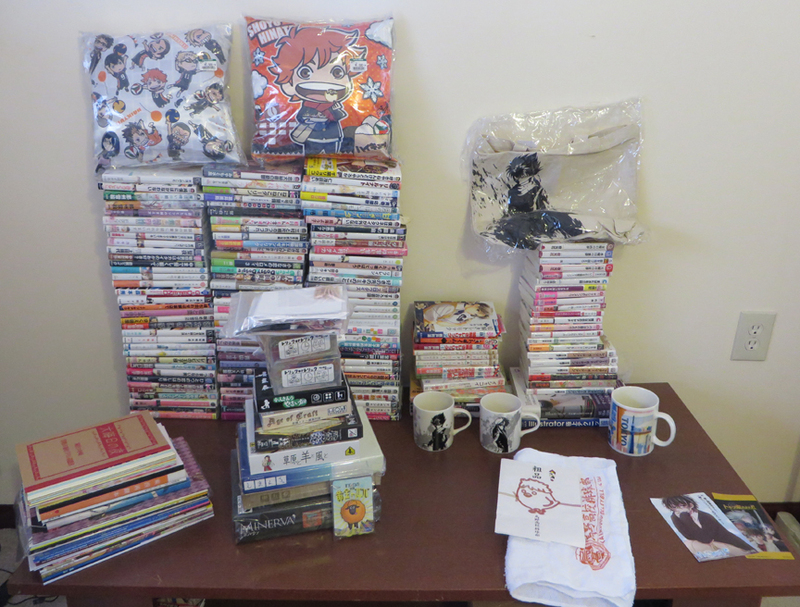 In previous years, the items we wanted to purchase were spread out over 2-3 days. This year, however, all of the things we wanted to buy were being sold on the same day. That meant it took serious strategic planning to divide and conquer, because the vendor tables (and their sometimes extremely long lines) were located in widely separated areas of the event site. All four of us had different maps and shopping lists of things to purchase for each other. To give some idea of the amount of coordination involved, I believe the planning session took about 18 hours. We left the hotel at about 6:30am in order to get in line and into the event site quickly when the doors opened at 10am; vendors tend to sell out of desirable items early. Even so, we were quite far back in line (particularly those of us waiting on the East Hall side). By the time poor wednesday_10_00 got into the building and in line for the first vendor on her list, the line for the table was already so long that it was a 2-hour wait. With plentiful teamwork, we managed to survive the day and acquire most of the items on our shopping lists. Yay! We spent the rest of the evening dividing up our purchases and recovering. After shopping at Skytree, we headed to nearby Asakusa, a more traditional tourist spot. We browsed at a number of the shops lining the walk to the temple, though by the time we got to the temple itself, everything was closing for the evening. After finishing up our sightseeing, we went back to Tokyo Station to eat at a vegan restaurant called T's Tan Tan. It was delicious, though there was a bit of a wait for a table, because the restaurant itself is quite small. August 17, my parents and I separated from the group and set off for an overnight trip to the former capital city of Kamakura. Upon arriving, we had lunch at a cozy shoujin ryouri (traditional Japanese vegan) restaurant called Narutoya Tenzo. 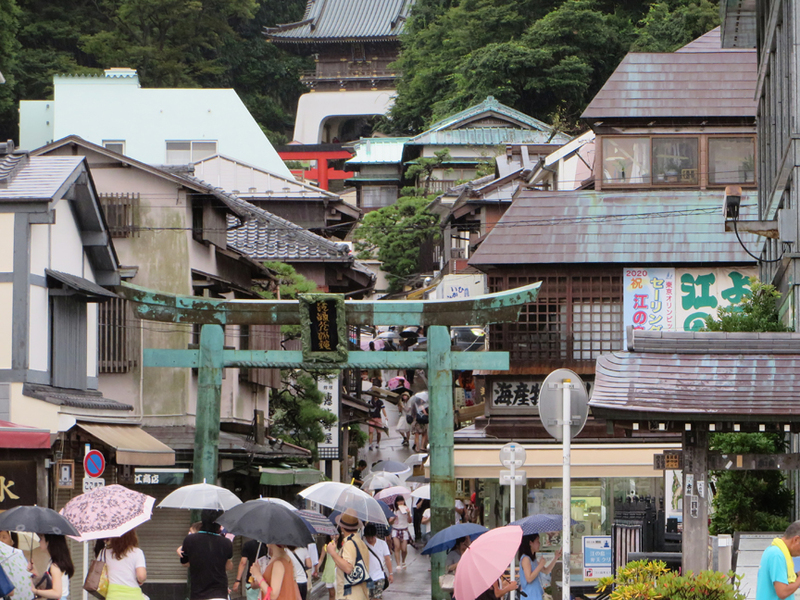 After that, we braved the rain to stroll along a shop-lined street to the nearby large shrine, Tsurugaoka Hachimanguu. 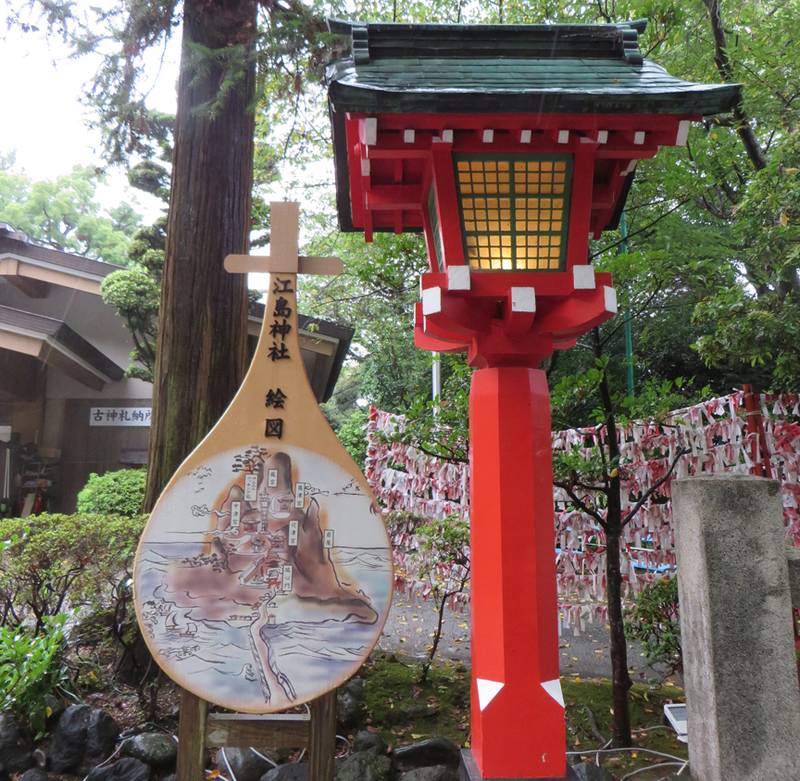 In the summer, this shrine is known for its lotus ponds. 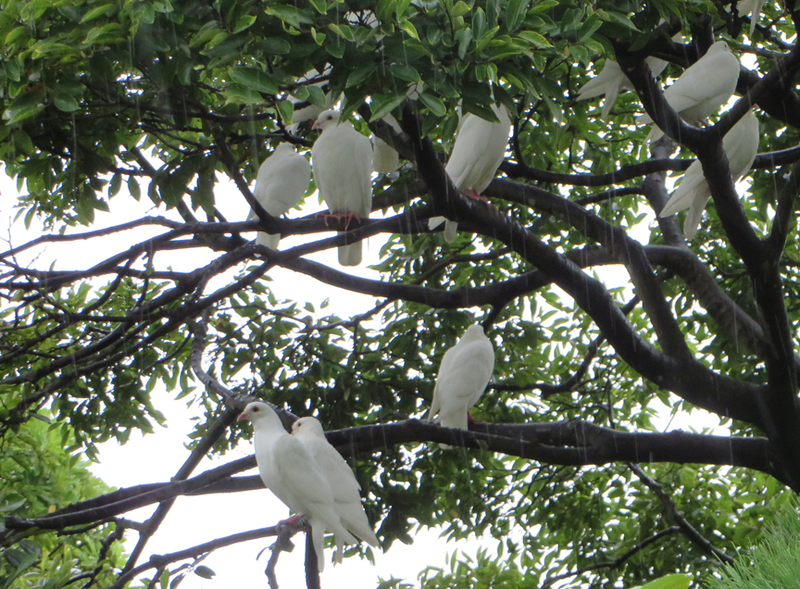 The central island of one of the ponds was inhabited by a flock of doves. I had planned to stop at more places, but the awkwardness of trying to manage our overnight bags and umbrellas and cameras in the rain was getting us down, so instead we headed to our lodging to check in. To get there, we took the Enoshima Electric Railway, nicknamed "Enoden." This train runs along the coast, at some points becoming essentially a streetcar through the towns along the way. This area tries to give visitors the impression that they are vacationing at a tropical island resort area. To this end, some of the train staff wear Hawaiian shirts. There are also numerous Hawaiian goods shops to be found. After a short wait, we checked into our room, which was set up like a traditional inn, except with actual mattresses on the floor instead of the typical Japanese futon. 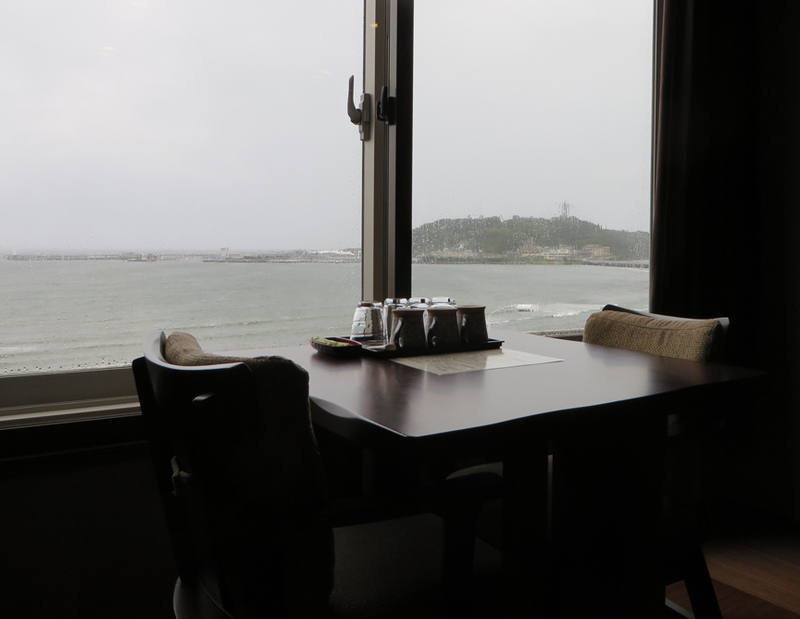 Our room faced the ocean, and we had a lovely view of the nearby island, Enoshima. Once we were able to drop off our luggage in our room, we felt much better about walking around in the rain, so we headed for a walking tour of the island. 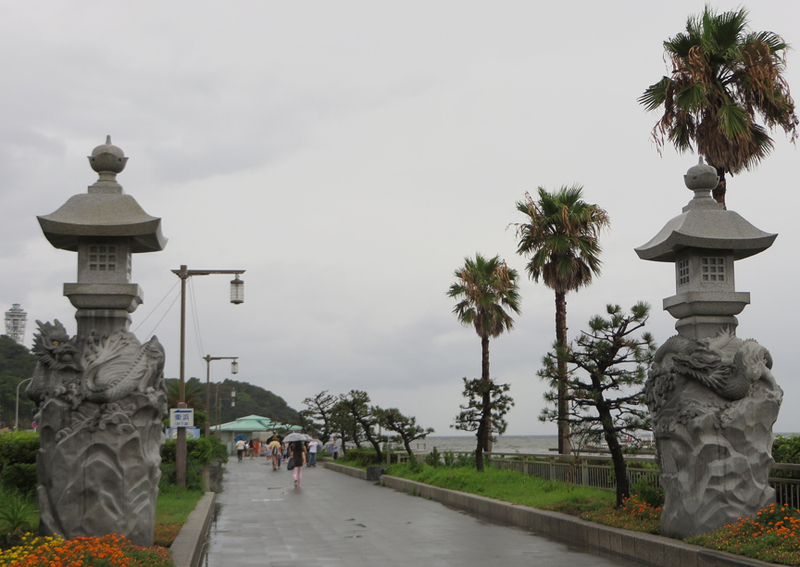 The pedestrian bridge to get to the island is guarded by a pair of impressive stone lanterns wrapped with dragons. Upon reaching the shore of the island, visitors encounter a number of shops and a pathway leading up the hill to the large shrine complex covering most of the central portion of the island. Decorative maps help visitors find notable sights. 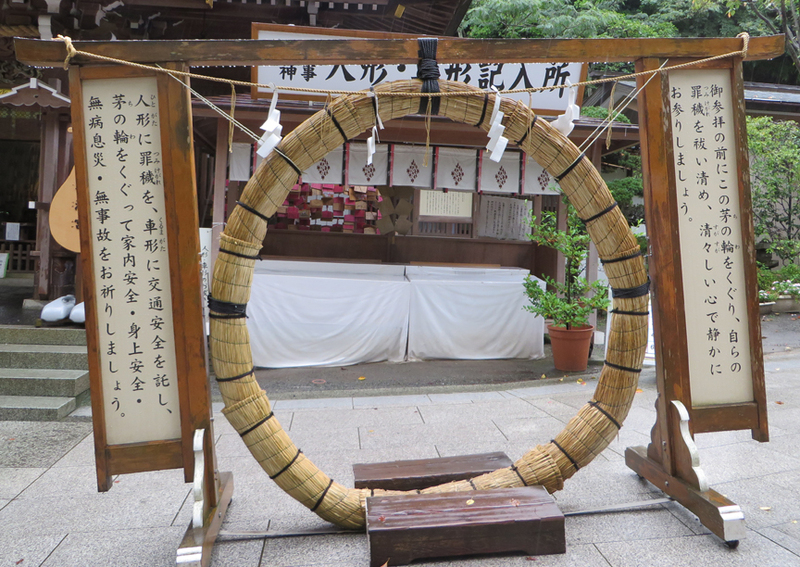 Those coming to pray can walk through a straw circle for purification before communicating with the gods. A nearby dragon fountain also allows visitors to wash and purify their money. 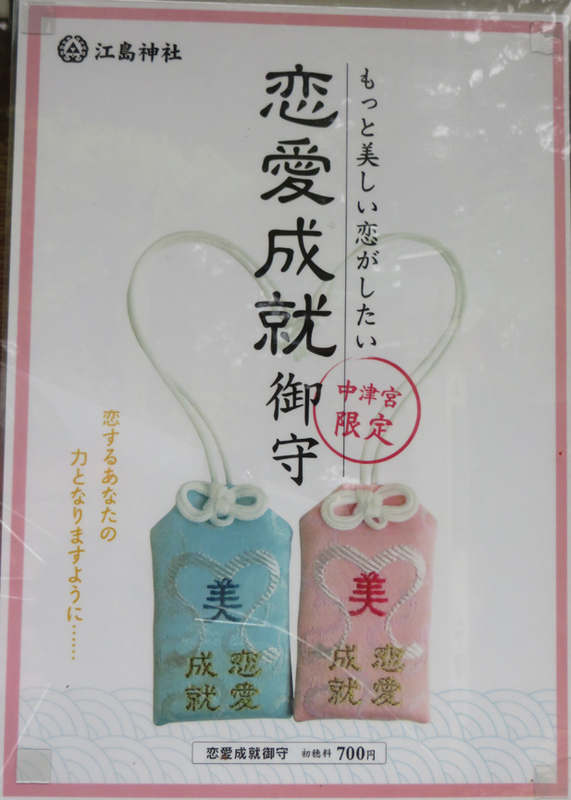 At this particular shrine, romance is big business. Visitors can purchase pink wooden tablets upon which they can write their romantic relationship wishes. 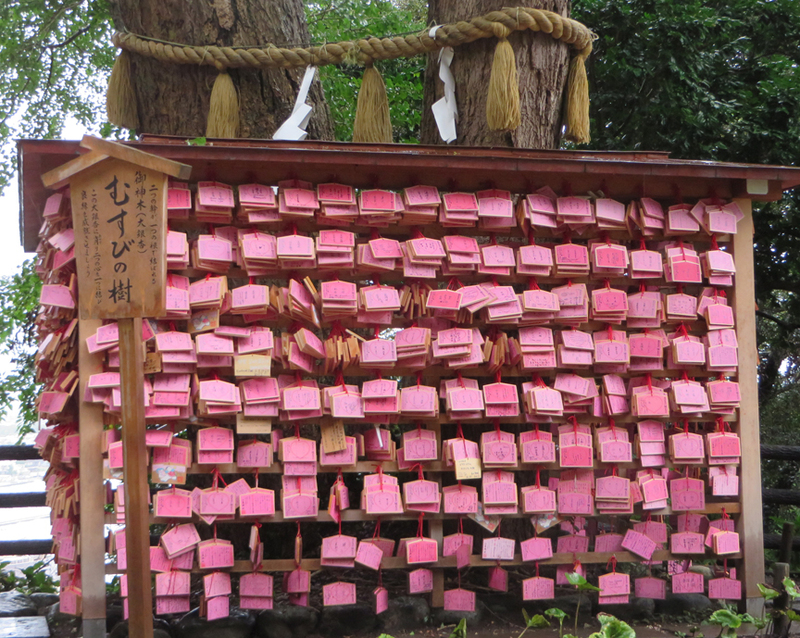 These wishes are hung next to this large holy tree, which is supposed to help the wishes come true. Visitors can also buy love charms in the hope of getting together with that special someone. In contrast to those wishing for a relationship, those visitors who are already in a relationship can visit the nearby Bell of Dragon Love. 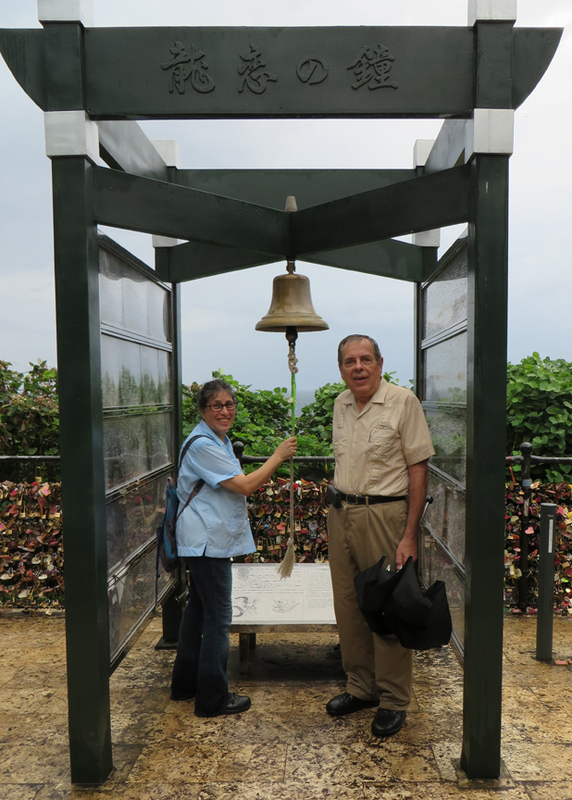 It is said that couples who ring this bell will stay together forever. For additional insurance, couples can purchase a special padlock, write their names on it, and attach it to the fence (a portion of which can be seen behind my parents in the photo). 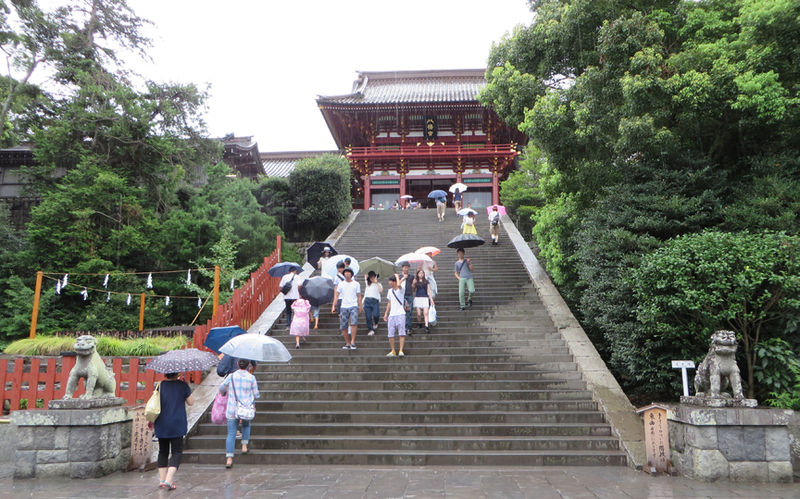 We walked a complete circle around the shrine complex and returned to our lodging for the night. In the morning, we set off on more walking tours. At a stop about halfway back to Kamakura, we encountered an 800-year-old temple that is making an effort to appeal to a modern crowd. A sign at this temple, which again focuses on relationship success, proclaims that visitors can gain the benefits of the temple by taking a picture of these statues and setting the image as the background on their cell phones. 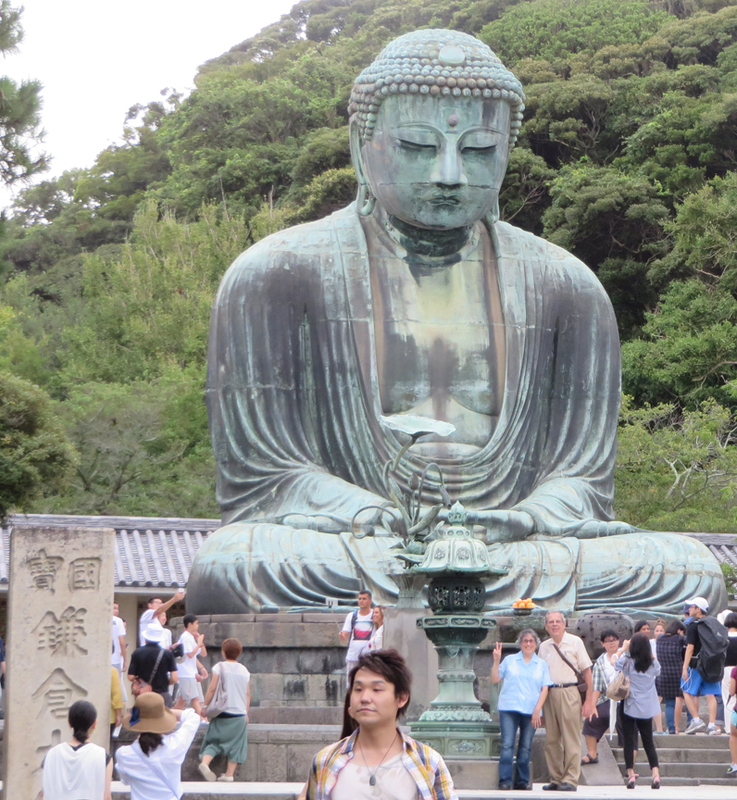 Next we stopped at the giant Buddha statue at Koutokuin. 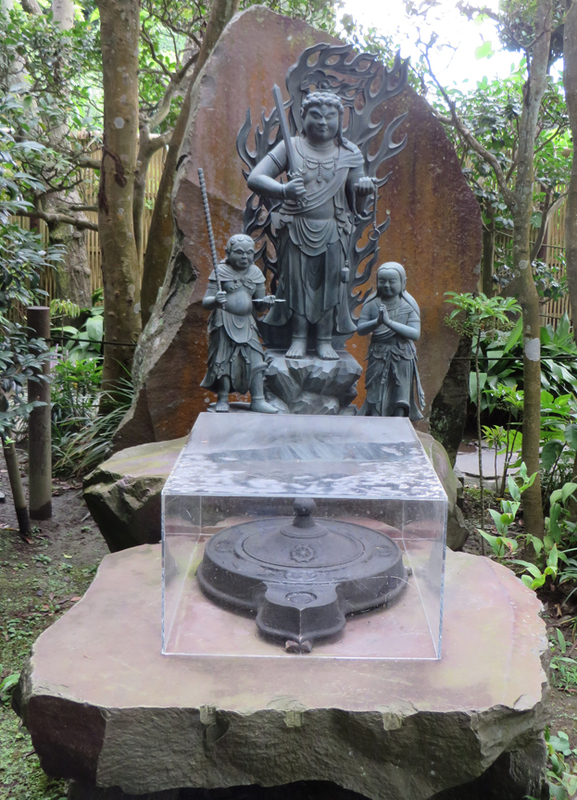 In addition to the entrance fee (about $2), visitors can pay a few cents to walk inside the statue and see how all the individual bronze pieces fit together. We continued our sightseeing, also visiting several shops along the way, ending with a nice meal at a soba/tempura restaurant in Kamakura station before heading back to Ikebukuro. Friday, August 20, was our last day in Tokyo. After packing up our belongings and checking out of our room, we had to pass the time until our late-night flight home. 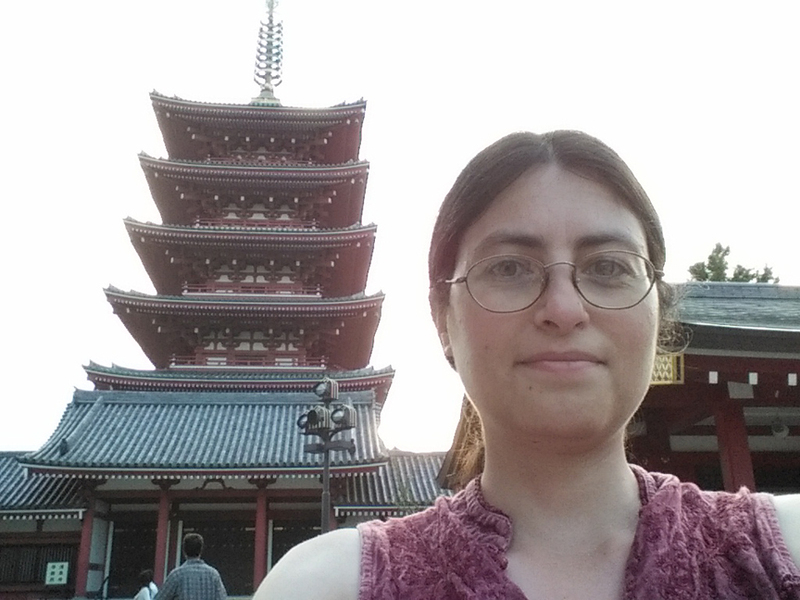 While my parents visited with some former study-abroad students they had met in Michigan, I went on a walk with sara_tanaquil to locate a nearby temple. 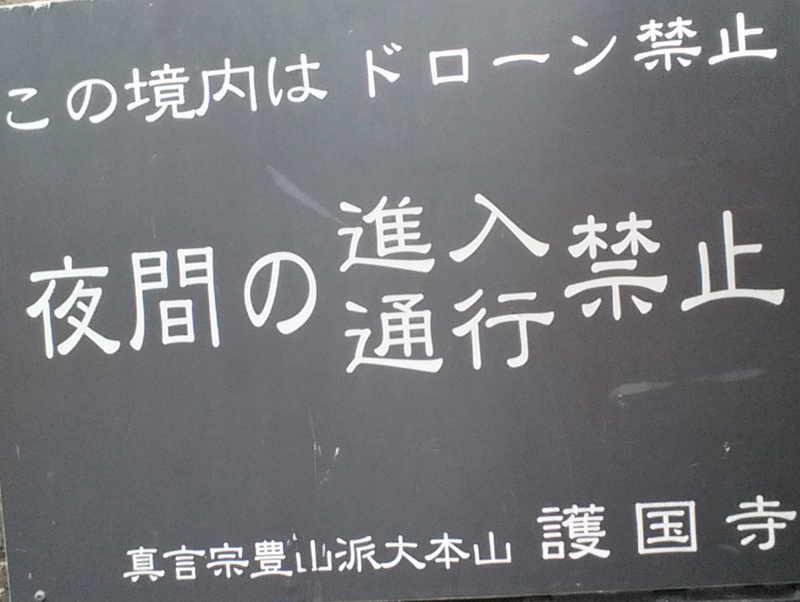 (It turned out to have a subway station entrance right in front of it. Now we know.) I found it interesting that Japan is apparently quite concerned with the proliferation of drones. This sign at the cemetery attached to the temple proclaims that drones are prohibited on the grounds. It was not the only anti-drone sign I had spotted on the trip; I had encountered another one at Enoshima warning that using drones during a fireworks festival could be dangerous. I had all of Saturday to recover from the trip before I starting work again on Sunday. (Benny was excited to be back on the job again!) On Monday, the workers arrived to put in my new fence. They made good progress and finished in two days. The ground isn't completely level along the length of the fence, so there are a couple areas that may need to be filled in to prevent a dog from slipping underneath, but I'm really happy about it overall. The new gates are great. Hopefully Benny will have fun running around in the yard after he retires next year. those visitors who are already in a relationship can visit the nearby Bell of Dragon Love. Oh, I was hoping that would be a picture of your parents with the bell! 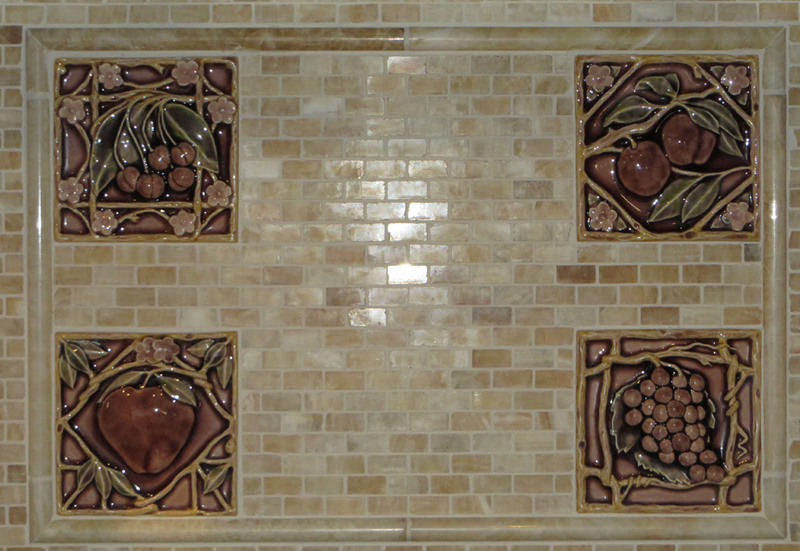 The kitchen tiles look gorgeous. It must be so pleasant to have that finished feeling, too. I may have more to say about the trip report later. Right now, I am struck by a distinct sense of separateness, not just for the times you traveled away, but for the very different experiences with umbrellas at Disneysea (I had my compact brolly by then) and the wait at Comiket (Team West was so close to the front of the line that we were moved inside Tokyo Big Sight to wait for the doors to open. It was a thrilling, new experience. I guess we've learned that in the battle between fan and original doujinshi, the crowds opt for the fan stuff first). Thanks! It is nice to have everything done. Now I just have to worry about keeping it presentable. I'm looking forward to seeing more trip reports. Everyone has a unique take. Even on the same trip, each person can have a completely different adventure. Wow! Sounds like a lot of fun was had!! Love your coffee mugs! I'm surprised Benny will be retiring next year, doesn't seem all that long ago that you just started! Sounds like a lot of fun was had!! It was an action-packed couple of weeks. I was pretty excited to find them. I was surprised a series so old still had merchandise at Animate. Maybe it was some kind of anniversary. I'm surprised Benny will be retiring next year, doesn't seem all that long ago that you just started! The time does seem to go by in a blur when there's so much to be done. I am so grateful for your narrative and photos. I'm realizing that what I trust to my memory quickly becomes a blur. I loved reliving the wonderful times through your entry. I'm realizing that what I trust to my memory quickly becomes a blur. It's the same for me...even when events seem so vivid at the time, after a few days, it's hard to remember exactly what happened and when. I had to take notes to jog my memory. Sounds like a fantastic trip and WOW that's quite a haul! It was a great experience. I hope you can come along on the next one! 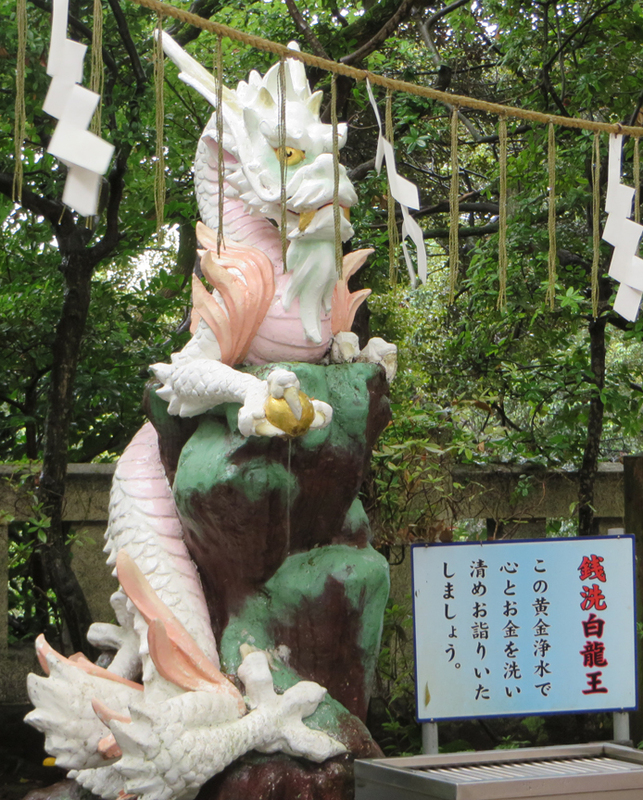 Love all the dragons in Kamakura! Looks like your room was nice and cozy, too. Did you not mention the dinner because it wasn't awesome (did they fill your supposedly vegetarian dishes with seafood)? Next time, I hope we actually go up Sky Tree...and maybe pay more attention to how things work in general? I felt dumb when I realized the Haikyuu Cafe was by lottery reservation. I don't know why I thought you could walk right in and get seated. Looks like your room was nice and cozy, too. 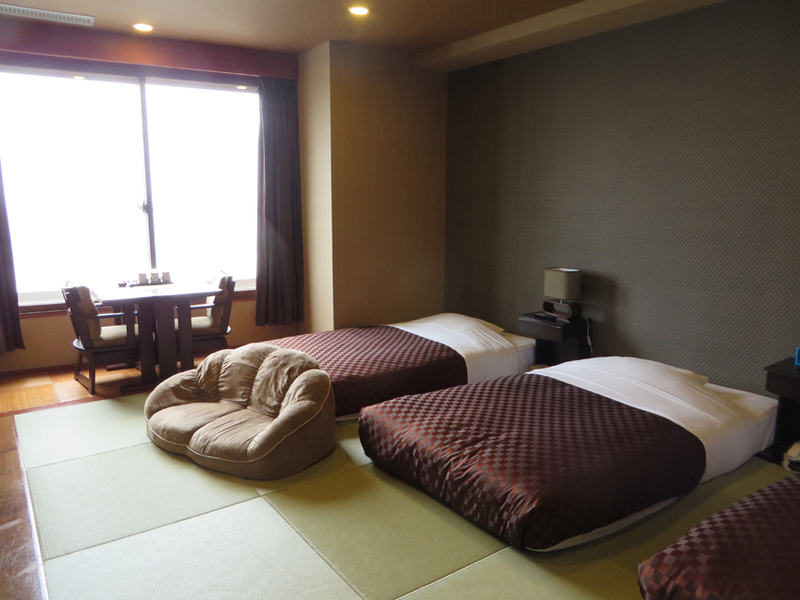 It was very nice for three people, and the floor sofa was great for watching TV. Did you not mention the dinner because it wasn't awesome (did they fill your supposedly vegetarian dishes with seafood)? We bought stuff at the Kamakura station bakery for supper, so it wasn't anything special (although the fig bread shaped like an actual fig was cute). The inn only provided a breakfast buffet (croissants and scrambled eggs and coffee). It was good, but they didn't have enough tables for all of the guests, so we had to sit on a chair in the lobby instead of in the dining room. Next time, I hope we actually go up Sky Tree...and maybe pay more attention to how things work in general? Frustratingly, it also says that online tickets can only be purchased using Japan-issued credit cards. Perhaps two years from now (or whenever we go back) the popularity may taper off somewhat. Yep, no mention that the wait could be over two hours. Well, that seems like it would be a weird thing for them to put on the website, honestly. I guess you're right that there was no way for us to know how long the wait would be, but after all our experience in Japan, it seems like we should know that new (or temporary) and popular attractions are not things you can just walk up to. Well, that seems like it would be a weird thing for them to put on the website, honestly. Not necessarily. From a practical standpoint, if they were to say "Typical wait times can be X hours," that would inspire more people to use the online reservation system. Since they're getting more money for the online tickets, that's extra profit for them. That's a win for the Skytree staff and also a win for the tourists who have saved themselves hours of pointless waiting, making them more likely to recommend the experience to others. Even those who don't want to (or can't) order tickets online will then be prepared for spending X hours waiting--probably by shopping at the Skytree mall, which is a win for those tenants. In contrast, failing to announce the wait time in advance results in visitors like us, who take one look at the 2.5 hour wait and decide not to buy tickets. Less profit for them, poor experience for us, lose-lose all around. Of course, I say this coming from an organization that pays excruciatingly detailed attention to wait times. Not necessarily. From a practical standpoint, if they were to say "Typical wait times can be X hours," that would inspire more people to use the online reservation system. That's assuming they would pay rather than just not go. And we may not have gone up to the observation deck, but we all spent money in the mall, so they're better off with more customers like us than those who don't come at all. Honestly, I sort of wondered if the timed entry was designed to get people to shop at the mall more. If it had been earlier in the day (and/or if I hadn't been tired from Comiket), I might have been okay with shopping until our entry time.